Emozioni indimenticabili e relax in una Romagna inedita. Sono i piccoli dettagli a fare la differenza, il segno della nostra ospitalità. Un soggiorno in relax per esplorare i dintorni, tra eventi e borghi medievali. 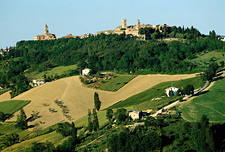 From the top of the hill, La Sorcina Natural Bed & Breakfast offers a breath-taking view over the surrounding landscape and the sea: the sparkling strip of the Adriatic Coast becomes the blue framing for the gentle hills which soften out this part of Romagna. 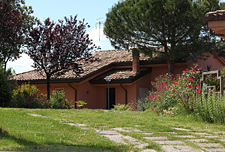 The villa of La Sorcina is located in Saludecio, in the countryside just a few kilometres away from the nearby town of Cattolica and easily reachable through a paved road. The house is surrounded by a large garden of about six thousand square metres wide. The rooms are equipped with all amenities, ready to welcome you in a natural and harmonious setting for a fully relaxing holiday. A villa surrounded by nature, an oasis of silence and relaxation near the village of Saludecio, just a few kilometres far from the coast. Four rooms, each one with its distinctive features: all of them will surprise you with their cosy and elegant décor. A nap under the sun? 5000 square metres of nature are fully at your disposal. Events, concerts, countryside festivals: see all our proposals about what you can do in La Sorcina’s surroundings.